In our modern world, the piano is a mainstay instrument common most types of western music. However, the modern piano has only been with us for about 300 years. The Italian Bartolomeo Cristofori (1655-1731) is generally considered the inventor of the piano. The piano was based on earlier instruments like the harpsichord (which was loud enough for concert play, but lacked the expressive control sought by composers and players) and the clavichord (which offered expressive control, but lacked sufficient loudness). The instrument remained largely unknown until an Italian writer Scipione Maffei wrote a widely circulated article about the new instrument that included a diagram. That article inspired a generation of piano builders. Today the instrument is a vehicle of expression for composers and players and a means of inspiration to billions of listeners. The following affirmations are written for those intrepid pianists at all levels seeking to bring their brand of beauty into our world. I have used piano player and pianist interchangeably. Use the one that works best for you. I am a great piano player! I am a great piano player! I am a great piano player and I get better and better each and every day! I am a good pianist and ready to be great! I am great pianist and ready to be world-class! I am a great piano player! I use the piano to connect my heart to the listener’s ears. I am a great piano player! Who I am is expressed through the keys on a piano. I am a great pianist! I am a worthy next step to the great pianists of the past! I am a great pianist! I transform the composer’s vision into a work of art for the ears! I am a great pianist! I add something special to an ensemble! When I am at the piano, I am in my zone! 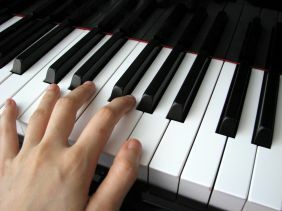 When I am playing the piano I am calm, cool, and confident! Breathing in, I am attuned to the piano. Breathing out, I am one with the piano. Every time I sit down at the keyboard, I make a difference in the lives of my listeners! A great piano player lives within me! Today that piano player shows up in my auditions. A great piano player lives within me! Today that piano player shows up in my recital! A great piano player lives within me! Today that piano player shows up at my concert! When the pianist is ready, the audience appears! I am ready and my audiences are growing! Piano is my passion and I live my passion to the fullest! When my fingers dance across the piano keys, magic happens! My technique is flawless and it comes through in the music I play! When I play the piano, the melody shines through like sunlight in the morning! I am a great artist and the keyboard is my canvass!